I discovered last month in the course of a rare foray to Madrid’s Flea Market, the Rastro, that a building I photographed in August 2008 for my collection of armorial stones is no more. 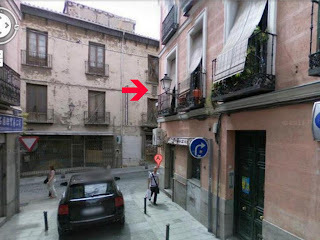 By coincidence, Google’s Street View car ventured into the area in the same month that I photographed it, so the building’s ghost can be conjured by typing its address – Embajadores 18 – into Google Maps. Intrigued by its absence I searched for further news, and found this article in Madrid daily El Pais by Esther Sánchez, which – in queasiness-inducing detail – leaves no doubt as to the grim fate of the building’s heraldic device. She quotes architect Álvaro Bonet as having spoken to the workmen who demolished the building; they told him the arms had smashed into pieces after falling to the ground in the course of their demolition. Score one for preservation, then. While the building had been recorded as being derelict way back in 1963, city hall did not begin expropriation proceedings until 1999, and did not assume legal ownership of the building till 2011, according the the article. It appears that since then, employing a tactic beloved of property spivs and slumlords the world over, Madrid city hall simply allowed its new asset to languish with no maintenance at all, before suddenly deciding that, hey presto, it was at risk of imminent collapse and so must be demolished at once. 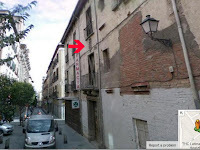 It seems odd that not even a few fistfuls of Euros – or pesetas, given how long the building’s state had been known to be precarious – could be found for preservation, when during the same party’s uninterrupted tenure in office since 1995, it has found bucketloads of cash to incinerate on 3 Olympic bids in twelve years (two of which failed, an achievement the city now seeks to make into a hat trick). Untold millions also went into a pharaonic refurb on the city’s main Post Office at centrally located Plaza de Cibeles to turn it into a city hall worthy of the then Mayor; his successor, the current Mayor, showed the nature of her austerity by promptly closing a museum, the Museo de la Ciudad, so that the entire building could be given over to more office space for city bureaucracy. To end this entry on an appropriately sour note, I need only echo the closing of the El Pais article, which points out that having seen how well this strategy works for getting rid of unprofitable ancient real estate, city hall is now eager to do the same for a nearby derelict mansion house, the 19th century residence of the Dukes of Sueca. The current administration having given ample evidence of its benign stance towards property speculation, one could be forgiven for assuming that more armorial stones are in danger of imminent reduction to dust. Unlike the knights’ shields they represent, they provide no defence against rapacious hostility.